I'm back in Georgia this week to help my husband pack up and move the last of our things home to Louisiana, and get his things ready to move on to the next project site. While we're here, we took the opportunity one night this week to eat at one of our favorite local eateries, Mike & Ed's Bar-B-Q on Veterans Parkway in Columbus. Boy was I in for a big surprise the first time I ate at Mike & Ed's. At home, bbq, especially sandwiches, is beef, and it comes chopped or sliced. Yes, we also have bbq chicken, and of course ribs and sausage. But the true test of a good bbq joint is their basic chopped beef. If they can't do chopped beef right, well--let's just not even go there. So imagine my shock as I looked over the menu and Mike & Ed's, and they had no beef--no beef anywhere on the menu. No chopped beef, no sliced beef, no brisket platter or beef-by-the-pound. No thick sweet sauce. Their sandwiches were pork. What we call chopped, they call chipped. What they call chopped was bite-sized chunks. They put slaw on the sandwiches. And pickles. And the sauce was yellow, and thin--it comes hot or mild. They do have a hickory flavor, but it's thin, too, and kind of vinegar-y. Good, just not the thick, sweet sauce that I was used to. But they did have one great thing going for them--great smoked flavor. I learned to eat chipped pork instead of chopped beef. And to actually like slaw on the sandwich--it's not bad as long as you eat it right away so that the bread doesn't get soggy. (just be sure to order the slaw on the side if you get it to go!) 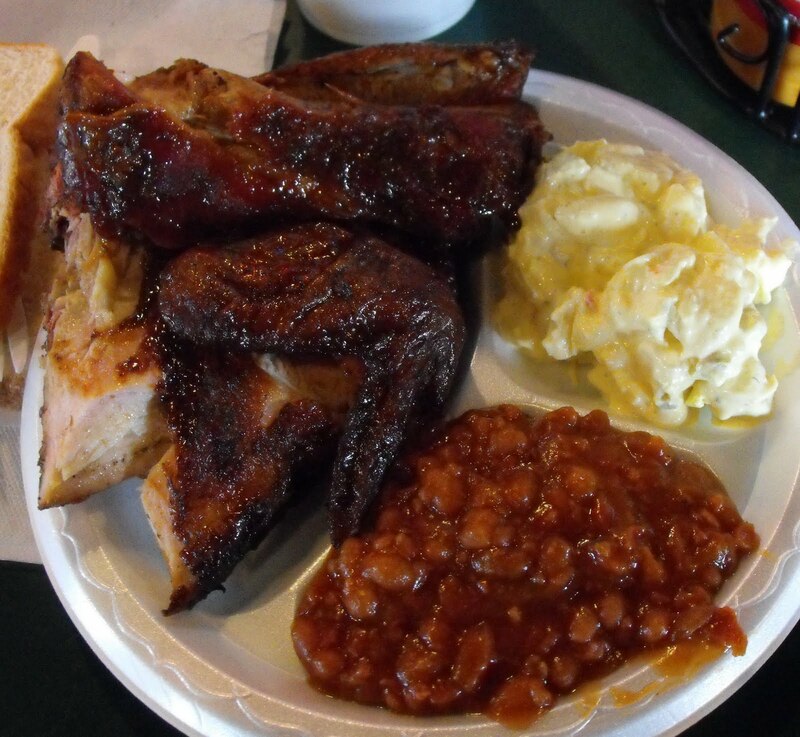 And the chicken and ribs (pictured above)--are sooooo goooooood! They have a couple of strange-to-me sides--brunswick stew, bbq stew and bbq slaw--they're okay, but to me they just don't spell barbeque like their baked beans, potato salad, and cole slaw. And how can you not like a bbq joint that has just right mixture of brick, wood and tin for their decor? Or that labels their bathrooms "Hens" and "Hogs"? At least they aren't labeled "Sows" and "Hogs"! And it really is magic--we went this week intending to order a couple of chipped pork sandwiches and an order of french fries, but it smelled so good, we both ended up with a chicken and rib combo plate! So whether you're used to Texas or Memphis style, Carolina pulled pork or Kansas City ribs, Mike & Ed's is well worth the stop when you're in the neighborhood. If my luck holds, I'll still make it by there for a chipped pork bbq sandwich. I'd forgotten that slogan! It's been a while now, I surely would love to visit Columbus, and of course, Mike & Ed's!